ATI Compu-Flow Valve Bodies provide the most accurate and efficient hydraulic controls possible for automatic transmissions. Years of research and testing have enabled ATI to design optimum oil circuitry for all popular transmission applications. COMPU-FLOW STREET/STRIP VALVE BODIES While any of ATI's Compu-Flow Valve Bodies are "streetable", the Street/Strip Compu-Flow is the #1 choice. These valve bodies provide full automatic shifting if left in drive and manual shifting if low is selected. In either mode, the Street/Strip provides a firm, clean shift. 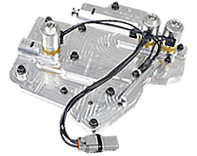 COMPU-FLOW REVERSE MANUAL VALVE BODIES Our Compu-Flow Reverse Manual Valve Body shifts opposite the OEM units away from neutral when up shifting (P-R-N-1-2-3). There is no automatic shifting. It will leave in the selected gear allowing street driven cars to move off in 2nd or 3rd in slippery conditions. The governor and related components are eliminated, as well as throttle pressure, cables/vacuum lines and linkages. All units freewheel if you lift in low gear; no engine breaking. (Note: All Turbo units freewheel in 2nd gear except #353400 for the T-350) This valve body is not recommended for the Powerglide since it must pass through low to get to neutral. COMPU-FLOW FORWARD MANUAL VALVE BODIES The Forward Manual Compu-Flow is available with the same features as the reverse manual units, except for the standard OEM shift pattern (P-R-N-3-2-1). Engine braking is available in all gears. The Forward Valve Body provides a generally slower ET for drag racing since the band or clutches are on in low gear. COMPU-FLOW REVERSE SAFETY TRANSBRAKES These valve bodies have all the same features of the highly successful ATI transbrake and they also have the added feature of reverse safety so that reverse cannot be selected accidentally or inadvertently. The vehicle will only engage reverse gear when reverse is selected and the transbrake solenoid is engaged. 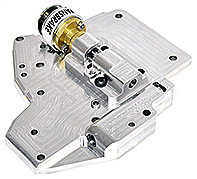 COMPU-FLOW TRANSBRAKES Lock your race car on the starting line for hard, consistent launches. All Compu-Flow Transbrakes are reverse pattern, except for PG applications. These units are fully manual - no automatic shifting. The TH400 unit #403080 has a low draw - 1 amp - solenoids operating pilot circuits. On internal brakes, the solenoid is inside the trans. An ATI transbrake valve body is an excellent choice for bracket and delay box users. PowerTV talks with JC Beattie about the Wicked Quick Billet Aluminum T400 Valve Body at SEMA. 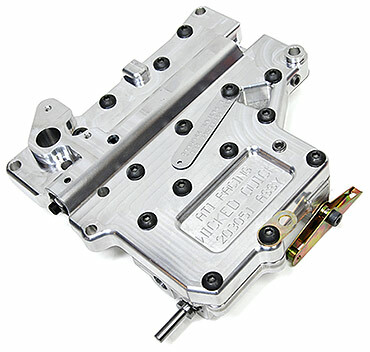 Repair services and wet testing are also available for ATI Valve Bodies. Consult your Sales Technician. Comes standard in Superglide 4 and 2 and High Impact Proglides! Perfect for any Powerglide Transmission and a full 7.4 lbs lighter than OEM - weighs 6.8 lbs as is, and 8.4 lbs with solenoid, adapter, filter and spacer. Titanium Bolt option saves another 1/2 pound! 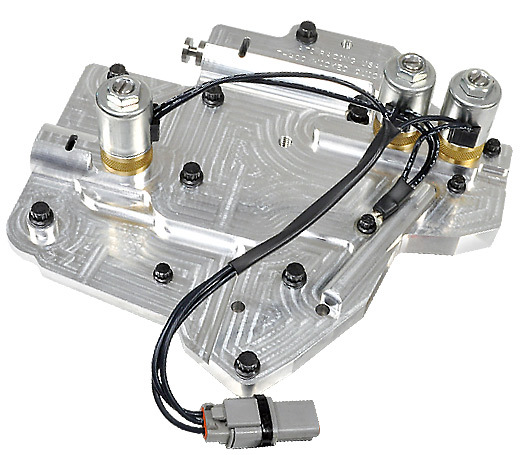 Due to hard to find cores, ATI Valve Body part numbers 203200, 203050 and 203250 are no longer available for sale over the counter but are used only in transmission builds. ATI is working on a new line of aluminum valve bodies to replace these and should be available soon. Clean Neutral Valve Bodies require different shifter. Contact sales tech. controlled error free shifting for consistent performance every run. Controller not required. 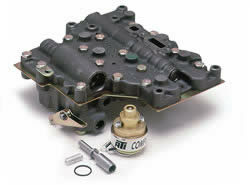 Repair services and wet testing are available for all ATI Valve Bodies. The Transbrake’s main function is to unload the chassis while staging to make the car shock the suspension and hook consistently. The brake will accomplish this at a mere 1000 RPM. Going higher on the brake only serves to super heat the oil in the converter and make for inconsistent launches. You should find an RPM that your engine is comfortable with (no stumble or hesitation), hopefully below 4000 RPM. Going higher on the brake will reduce the reaction time of the car, automatically putting you closer to the light. Then, the only reason for you to go higher on the brake is if you are late on the light. If you run a delay box, be sure to remove the time delay before testing. Many people have over a second in the delay box and stage the car at 5500+ RPM. The lower the RPM at which you launch the car (relative to the stall speed of the converter), the more free energy the converter gives you. Plus, your converter and transmission will live longer without the excessive heat. Many large, long stroke engines will run faster from a very low stage RPM. Many of our 350 cubic inch Super Stocker racers run the quickest from 1800 RPM. The converter will flash to its stall speed no matter at what RPM you stage, provided the engine responds properly to that RPM. Engines with two carbs and big plenums on the intake system will require higher RPMs to respond consistently. Again, going higher on the torque converter only serves to reduce the reaction time of the race car. The maximum amount of torque (power) is input to the converter. The maximum amount of load (work) is present for the converter to accomplish. Perfect example: The car is in a wheel stand climbing the ring gear and has not moved an inch forward while stall speed is occurring. When checking stall speed using the transbrake, it must be checked on the starting line. Stage the car, deck the throttle, look at the stall speed, then release the brake and let the car leave. Most converter damage is caused by lifting the throttle from stall speed. Wide open throttle on the brake is extremely detrimental to the health of your converter. Make sure you have a good ground to the chassis of the car. Run a temporary wire directly from the hot side of the battery to a new switch to the solenoid. If this fixes the problem, you have a ground or wire issue. If this doesn’t fix the problem, pull the solenoid and valve. Inspect them to make sure there is no binding in the solenoid or valve. Polish the valve if it has any sharp edges. Test the solenoid off the car. If it still doesn’t work, it’s time for a new solenoid. Call ATI’s Sales Technicians for assistance.